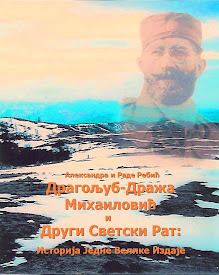 General Draža Mihailovich: CONGRATULATIONS TO THE WINNERS OF "THE FORGOTTEN 500" BOOK REPORT CONTEST 2009! CONGRATULATIONS TO THE WINNERS OF "THE FORGOTTEN 500" BOOK REPORT CONTEST 2009! On behalf of Michael Papich, who initiated this wonderful challenge and myself, Aleksandra Rebic, we sincerely thank all the young people who entered this contest and submitted their fine book reports for consideration! Thank you to all who purchased "The Forgotten 500" in order to donate copies to their government representatives and to libraries and other institutions across America and internationally. "Thank You" to those who donated financially for the rewards to be given to the children who entered the contest and to those who supported this effort through their publications and parishes and spreading the word. The success of this effort ensures that such campaigns will continue in the future. Curt "Bud" Diles, American Airman WWII rescued by the Mihailovich Serbs. To Michele, Jovanka, Marica, Djuka, Andjelka, Vaso (who wins 1st place for the "cutest, most charming essay of all"! ), Dusica, Natasha, and Peter, WE ARE SO PROUD OF YOU!!! I was first introduced to the Halyard mission by my grandfather who was a Chetnik in WWII. His battalion rescued three American soldiers during the war. I only knew stories of the mission and brief facts about Mihailovich, but I was unaware of the amazing rescue that took place and all of its achievements. The Forgotten 500 tells a story about a rescue mission that was made possible by General Draza Mihailovich and his troops under the most unfavorable conditions. Americans unexpectedly dropped from the sky in huge numbers in the mountains of Yugoslavia. With Nazi’s surrounding the area and the defense diminishing, Mihailovich made, what seemed to be an impossible mission, possible. With the collaboration of Mihailovich, the villagers of the area, the downed airmen and the few OSS agents that knew Mihailovich didn’t work with the Nazi’s, operation Halyard was a success in many ways, but a failure in others. Five hundred American airmen were rescued even with the overwhelming obstacles they encountered. But the deceit and manipulation of several British agents cost Mihailovich his life and handed over the 15 million people of Yugoslavia to a communist government. The Forgotten 500 is an important story that should be told for numerous reasons. It was an inspiring, powerful event, which was made possible by brave and strong people. The immense amount of work, determination, and courage that was needed to make the project a success, should be recognized and appreciated. 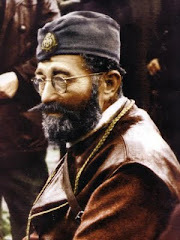 The mission should not be an event that is only known by the Serbian community. The work of the villagers, Chetniks, OSS agents, and Mihailovich should be written in history books. It should be thought of when WWII is mentioned. It should be celebrated in the United States as a triumph made between Yugoslavia and the U.S. in harsh and erratic times. War may often bring new problems, but the bond between countries can result in a powerful and inspirational force. The Halyard operation is symbol of determination and total bravery. What seemed to be an impossible mission, which included limited resources, few connections, and endless enemies, turned out to be a successful rescue that should never be forgotten. It shows that there are still are people who are willing to risk everything to help one another. In times like WWII and even today when events are unpredictable, successes like the Halyard mission represent more than just a rescue; it represents what a world could be if there was more trust and kindness. It is the epitome of human values. This story inspires hope in the darkest of times. The Halyard mission is an unforgettable and empowering rescue that should never be forgotten as told in The Forgotten 500. 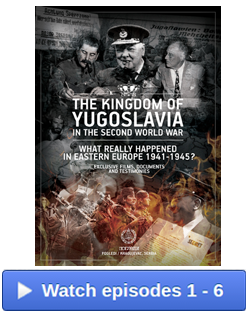 In a remarkable historical event, the weakest part of Yugoslavia performed one of the most amazing rescues in history. It shows that nothing is impossible. WWII was a time when countries would do anything to be victorious. But it was also a time where a small part of Yugoslavia and its collaboration with the OSS and immense amount of bravery, achieved a victory that should never be forgotten. Gregory A. Freeman’s “Forgotten 500” is a very important book that should absolutely not be forgotten. This great book contains many historical events that happened in a rescue mission during World War II. It tells how helpful the Serbian people were towards the downed American airmen. This historical book also explains how the OSS helped the airmen escape from German occupied territory and what the Americans did to help. One of the reasons why it shouldn’t be forgotten is for the benefit of the Serbian people. Serbia has not gotten very much credit for all the good things they have done for the United States of America. When the American airmen parachuted into former Yugoslavia, the Serbians did everything they could to keep the airmen safe. They fed them, housed them, and the Cetnik soldiers kept them safe from the Nazis. Sometimes, the Serbs would not have a meal that night because they gave all of their food to the Americans. In addition to the rest of their sacrifices, innocent Serbian villagers who allianced themselves with the Americans were discovered by the Nazis and they were killed. The Americans told Draza Mihajlovic and the rest of the Cetniks that they would turn themselves in but Mihajlovic said that it was an honor for the Serbians to risk their lives for them. Would you ever risk your own life to protect someone that you don’t even know? The OSS also played a huge role in Operation Halyard. The OSS set out to recover all 500 downed American airmen. Without their work and effort, the Americans would be trapped behind enemy lines for a much longer time. Operation Halyard was the mission that the Americans did in Serbia. 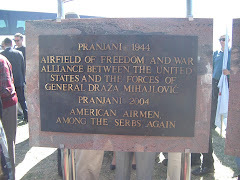 The Serbians helped the Americans assemble and build a landing strip big enough for C-47 cargo planes to land. Those airmen and Serbs had to do this all with no knowledge of the Serbian or English language, without causing danger to the Serbian villagers, without tools, and without letting the Germans find out. Can you imagine how difficult it would be to do that? “The Forgotten 500” should never be forgotten. 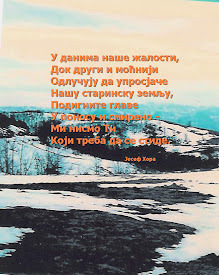 It tells how determined the Serbian people [the Cetniks and the villagers etc.] were to keep the Americans safe and healthy in that tough time. My grandparents, Nikola and Marica Potkonjak, were Cetniks and under the command Vojvoda Djujic. They fought against communism. So this book really means a lot to me and my family because the Cetniks did not get any credit for all the things they did and fought for. Everyone should know about everything this book talks about. This mission had a huge impact on not just those 500 Americans, but their families and friends and many others. Operation Halyard was perhaps the best rescue mission of World War II. "Take good care that nothing happens to these men. You must defend them, if necessary, with your lives. If any one of you comes to me with the news that anything has happened to a single one of those airmen, I shall have the man that bears this news executed on the spot." 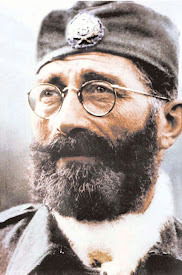 (Draza Mihailovich) General Draza Mihailovich said these very words to his Chetnik fighters to stress the importance of protecting the downed airmen in Pranjane, Yugoslavia because he felt it was necessary that they made it out of Yugoslavia safely. Indeed, every single one of the airmen trapped inside enemy lines in Yugoslavia made it out safely. Operation Halyard (the name of the mission to evacuate the Allies) was the biggest and greatest rescue mission of World War II and should not be forgotten by anyone. 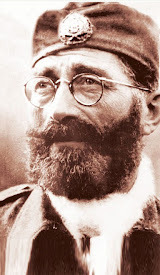 Mihailovich was a very important leader to the Chetnik fighters of World War II. He was courageous and brave, both qualities of a true hero. The fact that he was willing to risk his own life, as well as other Chetniks' lives, to save American should not be forgotten. Many of the airmen who had the honor of meeting Mihailovich said that they felt as if they were in the presence of a saint when they met him, and that his humbleness was truly remarkable. But, the rest of the world was under the impression that he was a traitor to the Allies and Tito becauase of the lies propaganda made them believe. This shows how easily people can be persuaded by falsehoods the media relay to the world. Mihailovich was completely opposite of a war criminal and never did anything to support the Nazis; he was actually in charge of an operation to help evacuate American airmen from Yugoslavia and back into safety in Italy. Although Mihailovich deserves a lot of the credit for saving the American fliers, none of it could have been accomplished without the Serbian villagers who housed the men for sometimes a very long time. The villagers gave all they had, which was not much, to the the soldiers including beds, food, clothing, shelter, and most importantly, safety. This meant that on some occasions villagers had to sleep in barns with their animals, go without certain items of clothing, and starve. But on every one of those days, they were risking their own safety and lives for - in their opinion - a greater good, which was keeping the Americans safe. These men, women, and children committed selfless acts of generosity, courtesy, and complete benevolence that should be known to the world. Without the help of these truly compassionate Serbian villagers, the airmen would most likely not have made it out of Yugoslavia safely. Many of the Forgotten 500 airmen said that they were eternally grateful to all the Serbs who helped them, and many owed their lives to them. They were taken aback by the kindheartedness the Serbs bestowed onto them. Once they were all evacuated safely into Italy, and then eventually sent back to the United States, the airmen were astounded that there were only a few people who knew about Operation Halyard. They could not believe that the U.S. government kept the mission quite because the airmen felt the entire world should know what Mihailovich and the Serbs did to help them. They were especially baffled when they heard that Mihailovich was to be on trial under Tito's courts for treason. Even though there was not much they could do in the United States because Tito would not take into regard the U.S. State Department's letters to let Mihailovich have a fair trial, they did try as hard as they could to make the story of their time in Yugoslavia known all over the world. The Forgotten 500 did all they could to make sure that their story was known to the world, and it is important that this story is still being told in generations to come. The Forgotten 500 portrays an aspect of kindness and humanity by many people including Draza Mihailovich, Chetnik fighters, and Serbian villagers. Their complete regard for the well-being of American soldiers is something that should always be remembered, especially in today's society where violence is very often seen more than kindness. Also, Draza Mihailovich and his Chetniks did all they could to make sure the Americans stayed safe, even if it meant their own lives were endangered. Even though many of the Serbs who helped the Americans were killed during the war or executed after, including Draza Mihailovich, the heroic acts they did while on this earth will keep them alive forever. As Mihailovich said, "I strove for much, I undertook much, but the gales of the world have carried away both me and my work." The Forgotten 500 tells a story that should never have been forgotten in the first place. People from two completely different countries formed a bond that lasted a lifetime. Five hundred American airmen were shot down over Serbia during World War II. The Serbs did not speak English and the Americans did not speak any Serbian, but together they conducted, to me, the greatest rescue mission of the war. This story should never be forgotten because it is about real people, the trust they gained, and credits the Serbs for saving the Americans lives. First of all, this book tells the story about real people at a time of war. When the Americans crashed into Serbia, they had no idea what would happen to them, who they would meet, or how they would survive. I cannot imagine how hard it was for them to reach the Serbians, not know anything about them. For example, Clare Musgrove, an American, was a ball turret gunner parachuted into the the mountains. he had to walk to a Serbian village thinking he might never make it out alive. He was brought into a home, unable to communicate with the villagers. I think that is amazing to have to have the courage to that. It is also amazing that the Serbs, without even a second thought, said yes and allowed strangers into their homes. They cared for them and fed them. Some even gave up their beds for the Americans. This story should also be remembered because it is about trust. The Americans had to trust the Serbs to survive the war. And the Serbs had to trust the Americans to survive as well, because if the Nazis found out they were protecting Americans, the Serbs would be killed. The Serbs protected these "foreigners" because Draza Mihailovich told them to. However, in the end, they gained each other's trust and believed in each other. How they learned to trust each other, and why the Serbs did what they did, is truly amazing. Maybe it is because if the Serbs were the ones needed help and protection, they would want someone to save them, too. Lastly, this book should never be forgotten because it speaks the truth. Some people today still think that the Serbs were not important in World War II. In fact, the Serbs have hardly been recognized for their acts of heroism and kindness during the war. 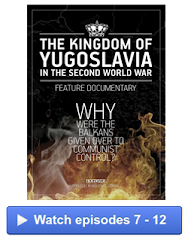 Most Americans do not know what the Serbs really did for America, and they really should. 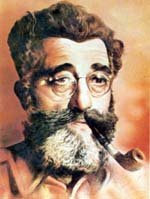 Draza Mihailovich told all the Serbs, "Protect every American that comes to your villages," and they did. Some even died for the Americans, including Draza Mihailovich himself. He was executed for "helping the Nazis," when in fact the very opposite is true. Unfortunately, this true story was ignored, and forgotten until now. 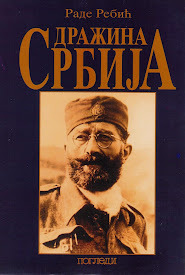 I am Serbian and when I read this book I was so happy that the Serbs were finally getting credit for all that they did. It also made me start to wonder what they did to make so many people hate them. In conclusion, this is an amazing book. It talks about very important events that happened in World War II that few people ever knew about. Also, it shares the bonds that these strangers made with each other, with another generation. More importantly, the author spoke the truth about the Serbs and the tough times the Americans and Serbians went through, and that to me is what makes this book a great one. As you can see, The Forgotten 500 should be shared with many more generations to come and indeed should never be forgotten. Draza Mihailovich once said, "I strove for much, I undertook much, but the gales of the world have taken away both me and my work." These were his last words before he was executed on July 17, 1946 for "working" with the Nazis. This man sacrificed his life to save these men. The Forgotten 500 should not be forgotten because it benefits Serbs, benefits Americans, and is without a doubt, a true act of heroism. One reason why the Forgotten 500 should not be forgotten is because it benefits the Serbian people. During Operation Halyard, many Serbs put their lives at stake to protect these downed American airmen. They knew very well that they might be caught in the act and killed, but that didn't matter to them. They wanted to make sure that the Americans were safe. Serbian villagers took these men into their homes not even knowing their names or speaking the same language. On more than one occasion, the Serbs slept in barns with the pigs to give the Americans a place to sleep. They sometimes didn't eat a meal at night because they gave the little food they had to the Americans. It takes a very whole hearted person to do this. These brave Serbs should be recognized for their act of heroism and all Serbs, Serb descendents and Americans should know about this. Although this World War II rescue mission was risky, Serbs still helped in any way they could. Another reason why the Forgotten 500 should not be forgotten is because it benefits Americans also. The Serbs didn't only save the lives of the 500 airmen that were rescued, but the descendants of the 500 men. If they had died, then their children wouldn't have been born either. It is estimated that if the men died, then over 12,000 people wouldn't exist either. The America people should know what the Serbs did for them and not just have it be forgotten. This is rich history that will be forgotten if we as Serbs don't pass it along to other people. Americans should know about what the Serbs did for them and thank them, not bomb them. Finally, the Forgotten 500 should not be forgotten because it is without a double an act of heroism on the part of the Serbs and Americans alike. Without the generosity and hospitality of the Serbs, these men would not have made it out alive. They would have been found by the Germans and killed. This is an act of heroism because day and night, these Serbs and General Mihailovich knew perfectly well that they might die for what they were doing. The Serbs could have just as easily turned them over to the Germans. To me, a true hero is someone who will risk anything and give anything to save someone. Indeed, this is exactly what these men did and why they are classified as "heroes". Without the bravery, hospitality and generosity of the Serbs, Operation Halyard would not have been a success. Many brave men and women saved these men not even knowing who they were or speaking the same language as them. In conclusion, the Forgotten 500 should not be forgotten because it benefits the Serbs, Americans and is without a doubt a clear example of an act of heroism. This book is called The Forgotten 500, by Gregory A. Freeman. It is about one of the greatest stories of the terrifying World War 2 (WW2), which is Operation Halyard, or the rescue of 512 downed airmen in Yugoslavian territory (Nazi-occupied). The book starts with Clare Musgrove. He was in a B-24 bomber's crew. He was shot down on his 8th mission: to bomb the oil fields of of Ploesti, Romania, a critical source of fuel for the German's war machine. Musgrove felt lucky to be alive, and he had little to complain about. No serious injuries had occurred, and he was only hungry and occasionally thirsty. 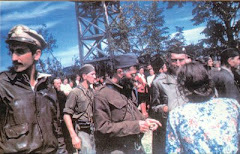 The Serbs who were escorting them (him and his men) took him to a village. There was little to eat. Food rations were all over the country. All foods were rationed for the Yugoslavian army or otherwise were given or stolen for Nazi's. A Chetnik officer who spoke English (fairly) told Musgrove and his men to go to where the other airmen went gathering, but he said “You go There”. The Serbians were risking their lives for the airmen, and also their food. They had very little, and Musgrove knew them eating food would mean men, women, and even children wouldn't eat that night. He spared, even though he was starving. Musgrove and his men were were walking from village to village, in need of aid and good news, when an OSS (later to become the CIA) agent found them while on horseback. His name was George Musulin, and he was to help downed airmen. They were gathering an Pranjane (Pronounced pran-yan-ay). At first, Musgrove and his men didn't get the hint that this was good news, but then they finally found out that their were about 200 airmen in the little village. Musulin told them that C-47's would be picking them up, but the airmen would need to build a landing strip, at least 700 meters long. They could not be spotted by Nazi's, and they had no tools, other that what the peasants had, which wasn't a lot. The radio people tried to contact the OSS and also the president of that time, Teddy Roosevelt. The message made Roosevelt want to save the airmen, but he was concerned about the British. A man known as Wild Bill Donovan, exclaimed “S__w The British! Let's get our boys out!” Fortunately,the president was in that same no-nonsense mood. The days that they were picked up were horrible at first, and then became better. While their were building the airstrip, and suddenly, they saw two JU-52 planes above them and a Stuka dive bomber. They hid from the terrible planes. Certainly the Germans would notice something if there only was cleared land in front of them. But a cow stepped on it, and the Germans thought this was normal, for cows to step on airstrips! So they left it alone. The operation took one day and night. The night mission came first, with 6 C-47's landing on the airstrip. The sick and injured went in first. And then the people who were in Yugoslavia the longest went on next. Others went after them. Musulin said that only 12 people were allowed to go on one C-47, even though the C-47 could hold twice as much. The morning mission was wonderful. A whole fleet of P-51 Mustangs and P-38 Lighting fighter planes were escorting the C-47's The Americans were so grateful to the Serbs, that they gave their jackets and shoes for them. When the planes left, a group of airmen arrived at the village, and were angry that they missed the pickup operation. This story is important to remember, because America now constantly battles in the former Yugoslavia, in Kosovo, and other places. This story was just forgotten, so the U.S. government pretends nothing happened, so they attack Yugoslavia because they want their resources, and because they don't want the public to find out the secret friendships of the men mentioned in the story with the Serbs. This story must be remembered to honor those brave and caring men who showed the world how loving and generous the Serbian people are! There are so many instances in World War II and other wars where rescue attempts of soldiers are publicized and praised as possibly the greatest feats of the time period. People talk about it all the time, stories are continuously in the news; people write books, sing songs, raise monuments, and create movies commemorating this event. However, a sincerely great story of Serbian valiance has been lost to the withering effects of time. One man found that story again and has done the world a favor by documenting it in his book The Forgotten 500. Sometimes the world can be an unjust and unforgiving place and even after Gregory Freeman has put his heart and soul into reminding people of the events that took place in Yugoslavia, it has been disregarded. There are simple reasons why this story is a great one that teaches many morals to the young people who will build the future. The Serbian people who not only risked their lives for men they didn’t even know, but they gave them everything when they had nothing. Reading about them teaches a lesson of kindness to others and generosity. The airmen that first risked their lives for justice and then landed in a foreign nation behind enemy lines where they had to hike through mountains and fields half starved and possibly injured with people who they couldn’t understand is a display of great courage and determination that makes a great molding for kids of this generation to follow. The agents of the OSS who risked their and others’ careers and ultimately their lives displays bravery and cunning beyond any other. Simply the fact that they were able to build an airstrip with practically nothing show the worth of hard work and willpower that would help anyone succeed in today’s society. Not only was the story of the Forgotten 500 an interesting one, but it was one based on true events and it plainly states that anything is possible with only strength of mind and courage. The stories of the people who went through these events shouldn’t be forgotten even after the grass has grown back on the field in Pranjane and the memories have been lost; the Forgotten 500 is a simple way of keeping the history of what truly happened alive. Think of all the great people in history. Then think of the people in The Forgotten 500. They were forgotten when all of those important people in history were remembered for what they did. If they are all remembered, why can't the peole of the Forgotten 500 be remembered, too? George Washington, Theodore Roosevelt, Abraham Lincoln, and Martin Luther King, Jr. are all big names in history. George Washington was our first United States president. Martin Luther King, Jr. had a beautiful "I have a dream" speech. But when you say Clare Musgrove or Draza Mihailovich, no one has a clue what you're saying. People need to read this incredible story of everyone helping each other. This is an important part of our history, yet few people knew about it. Everyone needs to know these soldiers and Chetnik's stories. Today so many people are remembered, but so many are forgotten. These people should be remembered , but so many are forgotten. These people should be just as important as our other famous fellows. It's like you not knowing who George Washington is. It's like important people not even being there. It's like nothing ever happened. But it did happen. It's been decades since this mission and if people don't know now, they never will and this story could eventually die out. Everyone knows all of those big names. Now it's time to learn the smaller ones. They could be better than those of the big names. If we can remember people from the 1500's, why can't we remember them from the 1900's? Everyone should be remembered, not left behind to be forgotten. 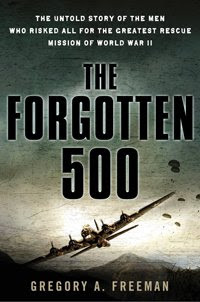 The Forgotten 500 by Gregory Freeman is an important book that should not be forgotten because it gives a historical and emotional account of a very little known episode of World War II. The heroes are the United States airmen and the Serbian people. The Serbian people risked their lives to protect our airmen. It is truly an unforgettable story of human courage, trust and love for one another. This is a story you should never forget.